Sorry to be so long between blog posts … no excuses. Having loved His disciples, Jesus continued to love them right to the end! He knew the soldiers were coming for Him, He knew the cross was only hours away, and yet His consuming passion was His love for His dear companions. He wanted to love them to the end. He DID love them to the end — and beyond. Before Jesus began this foot washing, He knew that He had come from God, was returning to God, and had been given every victory by God in advance. “Jesus knew the Father had given Him complete charge of everything.” He knew He had all power in heaven and on earth, and so what did He do? He took off His good clothes, put on an apron, and washed a bunch of feet! The complete victory and power He had from God, as God, strengthened Him to serve those He loved with abandon. Here was the Son of God and Savior of the world washing feet. He didn’t stand on dignity or ask for accolades (which He deserved, God knows!). He knelt on the dusty floor and cleaned dirty feet. It’s the same for you and me! We can forget what people think of us, stop asking for respect and affirmation, and rest wholly in these same facts: We come from God, we are going to God, and we have everything already as a gift from God! This is what empowers us — not to conquer and achieve, but to stoop and to serve. 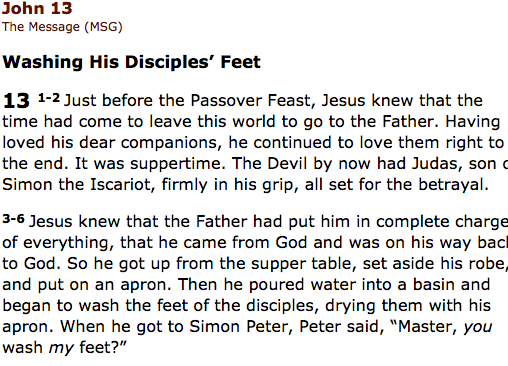 There’s lots more the the Maundy Thursday story. Please go ahead and read it in John 13-15 or so when you have time … but take a few moments to breathe in the wonder of these first few verses … He loves you til the end! This entry was posted in Uncategorized and tagged crucifixion, Faith, foot-washing, Grace, Holy Week, Jesus, love, Maundy Thursday, Passion Week, resurrection. Bookmark the permalink.